Once I knew some of my ancestors arrived in America during the 1600s, I just knew, I had to have a patriot ancestor, on who served in the American Revolution. I had two lines arriving during the mid-to- late 1600s. the Stanleys and the Roots. Later, I found even more lines, including my Oakley line. the one I qualified under was Miles Oakley, but I believe I also could qualify under his wife's father - Daniel Bennette. Since I already have done the work through Hawley Oakley (Miles son), it shouldn't be to hard to get Daniel added on. Well, my Stanleys may have fought during the American Revolution, but I'm not sure it was as a patriot. it was either on the British side or not at all. I do have a patriot on my Root line. Joshua Root, but I have to sort out some dates that have been floating out on the internet for birth/marriage/death dates that just won't work. That will be for another day. It has been a struggle to get back to my genealogy. This past year health wise with lupus has been a struggle. There are good days and then there are bad days. Unfortunately, last year there seemed to be more bad days than good where I just couldn't get my head into my genealogy. So far, March is looking pretty good. I need to stay healthy and keep focused on my genealogy. Why??? One of my dad's cousins got in touch with him after connecting with him with a DNA match and that got the ball rolling. In about a week's time, my Uncle and this cousin arranged to get a family reunion planned in Las Vegas the end of May. I'm really excited. Now I need to get all of my Blickhahn line in really good shape, so I can get so copies made, haven't decided if I'm going to make print copies or electronic copies but it should be great!!!!! I'm not sure if I'm up to it but I have about 50 pages of parish records from the Catholic Church in Epperthausen, Germany. The problem? They are in German. I could probably handle the German, but the old script and the poor copies, that will be the challenge. ﻿Well it has definitely been awhile! After some medical setbacks, it has taken me awhile to get back into my genealogy, but I've made some real progress over the past several weeks. One of the things I've had on my bucket list is to complete my application to qualify for the DAR (Daughters of the American Revolution). Well, last week, I was able to cross that my bucket list. I traced my lineage back with all of the necessary documentation to my Revolutionary War Patriot, Miles Oakley. My application went in Wednesday, March 22, and my understanding is that it will take about 3-4 months to hear back. As Miles was already listed as a DAR patriot, I only had to link back to the person who became a member using Miles. The chapter I applied under was a lot more particular than the chapter I had started to work with in Fresno. This chapter wanted everything better documented all the way back to Miles. It was good though, as I learned some good organizational techniques and more about early colonial records. So far, so good on my New Year's resolution, and now I'm knee deep into putting together a research binder for my Stanley line. I think the research binder is what has been missing from my research. No matter what though, I need to focus on one family line at a time. 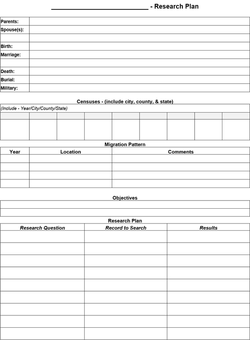 I've been looking at a number of research forms, and the same information has to be entered on each of the different forms. Then I got the idea to create a form that combines the information I need most . This is what I finally came up with the worksheet below. To see the whole sheet, click on the image below to access the PDF version. Click on image for the PDF version. Please leave me a comment if you have any suggestions to improve it. Thanks! Last night I found a copy of a book on the History of St. Peter's Catholic Church in Chicago, IL. From my prior research, I knew that my Blickhahn/Keller ancestors were members of St. Peter's. I stumbled across this book while looking for a picture of the church. Unfortunately, there were no pictures in this copy of the book, so I was trying to copy and clean it up, when I noticed a link at the top of the document, indicating there were other formats of the document. I clicked on the PDF version. As I scrolled down the pages, there it was a beautiful drawing of the church, a picture of the alter and a picture of the congregation during a church service. My ancestors could have been one of the people sitting in the congregation. I down loaded the document as looking at it online was slow going between pages. I can't wait to see what other gems are waiting for me. Check out the PDF by clicking here. The best laid plans for me never work out as something always gets in the way of my genealogy, but this time it was for good reasons...I didn't get to see my kids for Christmas, but our daughter came down the week after Christmas, and our son came out the week after that, and left on Sunday. In between all of that, I've been helping a friend from church's husband with proofreading his dissertation. His dissertation has been challenging for me, as his subject matter is very foreign to me (medical field), so at times, I'm not quite sure what he is trying to convey. I did succeed in finding time to watch one of the webinars at Legacy Family Tree. Current webinars are free and also free for a few days after each webinar. Last Wednesday it was Lisa Louise Cooke. She is always very motivating. Legacy offers a new webinar each Wednesday and occasionally on a Friday. 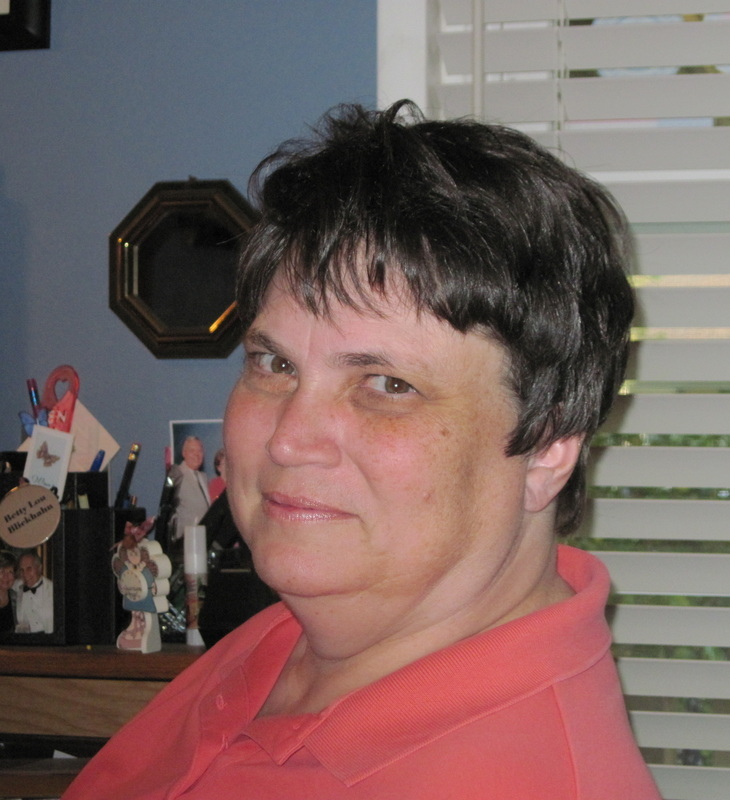 This week there is a webinar on Wednesday (Using technology to differentiate between two people with the same name) and Friday (Using the Snagit software for genealogy). My goal is to watch at least three webinars a week. (I have an annual membership so can watch them anytime). Legacy now has 293 top notch webinars in their archives). My old laptop started giving me a lot of trouble, so with the great prices on computers before Christmas, I bought a new laptop. Because I was looking for a computer running Windows 7, it was really cheap (but with the specs I was looking for). In between visiting with my kids and working on the dissertation, I've been working with on putting pictures into digital folders on my new computer. Since I have a new laptop, instead of just copying all of my data over to my new computer, figured this was definitely the time to do Thomas MacEntee's "Genealogy Do-Over." This means I put the genealogy data aside and literally start over. I'm feeling like a newbie, trying to figure out how I did something or found something before. I think it will be good to start from scratch, as before, my research was not done on a consistent basis. Sometimes it would be several months before I could find time to work on my genealogy and I'm sure I missed things because of that. I'll be blogging about my progress. I can't believe it is already 2016! My genealogy has really suffered in 2015 due to a number of reasons and not setting my genealogy as a priority, this year things are going to be different. My New Year's resolution is to spend at least 10 hours a week, working on my genealogy and blogging at least once a week. Since our kids decided to come visit us for a few days, Shannon for New Year's and Eric sometime within the next week or two, I had to get my computer room (which doubles as our guest room) in order and now, my room is ready to go, so now I can start in on my genealogy Monday morning. I'm not sure which line I want to work on yet. But I plan on figuring that out this weekend. I've been trying to listen at least one webinar each week from Legacy Family Tree Webinars and the most recent webinar I listened too was "After You're Gone - Future-Proofing Your Genealogy Research," the presenter talked about his newest book, 500 Best Genealogy & Family History Tips – 2015 Edition, by Thomas MacEntee The book is an 85 page PDF (great for reading on your iPad or iPhone). The cost of the book is very reasonable at $5.95 at Legacy Family Tree Webinars or $5.99 at Amazon.com. The book can be previewed on Amazon's site. I wasn't sure just how much the book would benefit me, as I have been doing genealogy for quite some time. I was pleasantly surprised at what I'm learning through Thomas' book. It was well worth the price. Not only does Thomas provide wonderful tips, but also links to relevant resources. Beginners, intermediate, and advanced researchers will all find something of interest in Thomas' book. Country’s fourth largest city devastated by fire! Stories filled newspapers across the country, the week of October 8, 1871, reporting a fire destroyed the city of Chicago. Chicago, a regional mercantile center had recently passed St. Louis as the United States fourth largest city. The tremendous amount of wood used to build the city of Chicago, combined with an extremely dry year; providing the conditions to fuel the devastating fire that left thousands homeless and cost hundreds their lives. Extensive historical and genealogical records were lost as city, county, and church records were consumed by the inferno. The fire was able to take their homes and livelihoods from Chicagoans, but the fire could not take away the stories, which were handed down from generation to generation; stories about how these people survived and how they rebuilt their lives and their city. The population of Chicago in 1871 was more than 330,000 inhabitants, a population made up mostly of Yankee elites and European immigrants. My ancestors were some of the many German immigrants who chose to make Chicago their home. At the turn of the century, Chicago was only a trading post on the Chicago River. By 1871, Chicago had ascertained status as a regional mercantile and was nearing status as an industrial metropolis, with international standing. Chicago was a city that had everything going for it and was growing daily. The city of Chicago contained a vast amount of wood. Because of the availability of wood, the city was built almost entirely of wood. Buildings were built in close proximity to one another, going up quickly and haphazardly, due to the rapid growth of the city. Fifty-seven miles of Chicago streets and 561miles sidewalks were made with wood. Lumber and wood products were stacked in lumberyards along the river. The area was experiencing high winds and drought conditions, with little rain falling since early summer. 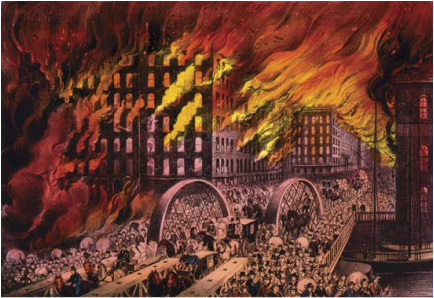 There have been many theories as to the causes of the Chicago Fire. The favorite theory is that Mrs. O’Leary’s cow kicked over the lantern in the barn. One part of this theory was found to be true, the fire did start in the vicinity of the O’Leary’s barn, but what actually stated the fire, we will probably never know. The amount of wood, the dry conditions and the high winds contributed to the fierceness of the fire. The fire, with its destructive and deadly force, lasted three days. Before the fire was extinguished by rainfall, it had claimed 2,124 acres; destroyed 17,450 buildings; left 98,500 people homeless and cost nearly 300 Chicagoans their lives. The estimated property loss was $200 million. While growing up in the Chicago area, I learned about the Chicago Fire through my Social Studies and History classes. To me, the Chicago fire was something that happened a long time ago and at that time was of little importance to me. It wasn’t until t started focusing on my father’s paternal line while doing my family history; I realized what had really been lost. It wasn’t just the loss of the buildings and lives, but also the loss of history. With the destruction of much of Chicago, many records were lost. As my genealogical endeavors progressed, I found that my roots were planted very deep in Chicago’s history. I have five ancestral lines (the Blickhahn, Keller, Seidelmann, Fiedler, and Laplanch families), who were living in Chicago at the time of the Chicago Fire. My ancestors were businessmen and business owners. They were furniture makers, cigar makers, and saloon keepers. All of them lost not only their businesses, but also their homes. My great-great-grandmother, Barbra Maria Kunigunda Keller, almost lost her life. She was home alone with her infant son when her home caught fire. She carried her young son to safety and returned to her home, which was engulfed in flames to save one of her most prized possessions, her feather bed. The city of Chicago was nearly a total loss, but Chicago and her people were strong. The thousands of immigrants who called Chicago their home rebuilt the city and their lives. Rebuilding their lives was nothing new to the hardy immigrants who were left homeless; immigrants who chose to rebuild their lives in Chicago after leaving their homelands. These immigrants did rebuild their lives and Chicago as well. The rebuilding of Chicago was mostly of brick. The buildings were built of brick, the sidewalks and streets were made with brick. By 1875, Chicago had become a city that had ascertained status as an industrial metropolis, a city with international standing. Chicago was a city that refused to die. In four years, Chicago was rebuilt with little evidence of the devastation from the fire. The new Chicago emerged bigger and better. I can't believe how long it has been since I've posted, but sometime life just gets in the way. Over the last couple of weeks, much of my computer time has been consumed with Pinterest. Once you get started, it is hard to stop. There is so much good things there, especially for genealogy. I started with one Pinterest board for genealogy, and now I have seven. I'm thinking I need more, as I think if I break the boards down even more, I'll be able to find the pins to my board easier. I have several hundred pins on my genealogy mapping board and it is difficult to find what I'm looking for. The first divisions I think I'll make is to divide the board into U.S. maps, maps of the British Isles, Germany. and Norway and then re-evaluate the divisions and see if I need to break the groups down even more. Click the link below for one of the best values in Genealogy Education! I live in Orange, California with my husband Bill, and my service dog Timber. Genealogy is one of my favorite past times.